Trudeau pledged support for the steel industry and said government officials are working almost daily to have the tariffs lifted. Stelco executive Alan Kestenbaum praised the Canadian government for being "incredibly supportive" of the steel industry as they continue to battle U.S. tariffs and try to protect jobs while navigating the industry's "changing landscape." 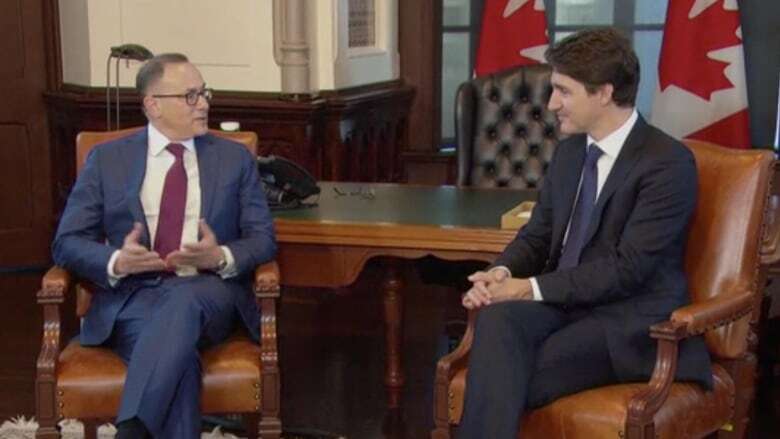 Kestenbaum and Trudeau made brief remarks to the media before the meeting at the Prime Minister's office Thursday, with the CEO thanking government ministers for being "extremely responsive" by text or phone. "The past support that we've had from the government and the quick, decisive actions we've had from the government have been very, very helpful," he added. "But things have changed and we're here today to talk about what those are and continue working together to persevere the jobs and build the company." The meeting came amidst continued calls from the Canadian government to have the tariffs on steel and aluminum lifted. Speaking about the new North American free-trade deal earlier this week, Foreign Affairs Minister ChrystiaFreeland described the "Section 232" tariffs as "absurd" and said lifting them is a key part of the trade deal ratification process. Trudeau echoed the sentiment, calling the tariffs "illegitimate" and the steel industry "extremely important" to Canada. "We are very much focused on supporting you and supporting the steel industry and all the workers," he said. "We are working almost daily in meetings with American officials to try and get those tariffs lifted." Hamilton-area MPs Filomena Tassi and Bob Bratina, who chairs an all-party steel caucus, were also present for the meeting. Tassi is Minister of Seniors. Bratina has been under fire from steelworkers recently for not doing enough for the industry, including a tense meeting in February where union officials claim he shouted "f--k the steelworkers" and "f--k those Stelco pensioners." The Liberal MP responded to demands for an apology with a statement saying the "conversation became personal," but that it ended with him assuring the union representatives "that we would continue to work hard for steelworkers and their employers despite this meeting."